All metals have unique advantages and disadvantages in terms of their mechanical properties. Advantages such as flexibility are needed for construction and for the manufacture of sophisticated products. Some industries have improved the mechanical properties of metals by welding dissimilar ones together, such as aluminum alloy (AA) to stainless steel (SS) to reduce vehicle weights in order to improve fuel consumption. However, little research has been conducted on using micro resistance spot welding (mRSW) to join SS and Al by inserting a zinc (Zn) sheet between them as an interlayer. In this study, the mechanical properties of the weldment are tested using a shear test and Vickers micro hardness test. The results are compared using welding times of 6, 8 and 10 cycle times (CTs) and welding currents of 5 and 8 kA during the mRSW process. It is found that the SS, Zn and AA sheets could be joined with mRSW using an 8 kAA welding current and a 6 CT welding time. The micro hardness in the AA-Zn dissimilar joint increased relative to SS-Zn. Using a Zn sheet also improved displacement in the tensile shear test; however, it also increased the hardness of the diffusion zone. All metals have advantages and disadvantages in terms of their mechanical properties. Advantages such as flexibility are needed for construction and for the manufacture of specific products. The automotive industry uses a process to weld dissimilar metals, such as aluminum alloy (AA) and stainless steel (SS), to reduce vehicle weights and thereby improve fuel consumption (Zheng et al., 2016). The physical and thermal properties of these two materials are very different, which creates some problems in welding them together; in particular, it is difficult to obtain a reliable fusion of the welded joints. Torch brazing has been used to join the dissimilar materials BJ DD2 steel and C12000 using varying pressures and lap joint lengths (Baskoro & Fauzan, 2015). The solid solubility of iron (Fe), which amounts to almost zero in AA, results in high brittleness in these SS-AA dissimilar joints and therefore reduces the mechanical performance of the welded joint (Zhang et al., 2014). Many researchers have therefore sought to develop improved methods for welding dissimilar metals. Dissimilar metal welding using an interlayer is one method to improve the nugget quality of a dissimilar metal compound. For example, when welding copper-tungsten (Cu-W) composites to a copper-chromium (CuCr) alloy, Cu-Fe powder can be used as an interlayer; these are then joined by employing bonding technology. The Cu-Fe interlayer increases the compound’s tensile strength; however, the Fe decreases the tensile strength (Xiao et al., 2017). In another study, Cu was joined to Cu with nickel (Ni) as an interlayer, using an ultrasonic diffusion process; the Ni interlayer was found to improve the quality of the bonding joints (Kumar et al., 2017). In a further study, nickel titanium (NiTi) was welded to AISI 216L SS wires with tantalum (Ta) as the interlayer; this joining process used laser welding. The Ta layer increased the compound’s tensile stress and strain and also affected its microstructure (Ng et al., 2015; Liu et al., 2016). The specific use of zinc (Zn) as an interlayer in dissimilar metal welding has also been the subject of previous studies. Li et al. (2013) used CO2 laser welding–brazing to join 1.5 mm sheets of AZ31B magnesium (Mg) alloy and DP980 steel, the latter coated with 15 ?m Zn. The Zn interlayer generally affected the compound strength, although the welding technique (laser welding) also had an effect. In another study, Patel et al. (2013) used ultrasonic spot welding to join a 2 mm sheet of AZ31B-H24 Mg alloy to a 0.8 mm sheet of high-strength low-alloy (HSLA) steel, with a 0.07 mm interlayer of Zn. The Zn interlayer increased the peak intensity and plastic deformation of the welded joint. Balasundaram et al. (2014) joined a commercial 1.5 mm sheet of Al 5754–O aluminum (Al) alloy to a 1 mm sheet of soft annealed C110 Cu alloy, using a 0.05 mm interlayer of Zn; the Zn interlayer increased the lap shear tensile strength of the joint. Boucherit et al. (2017) used friction stir spot welding to join a 5 mm copper plate and a 2 mm aluminum sheet, using 0.05 mm zinc foil as the interlayer. The thickness of the Zn had no obvious effect on the lap shear strength. Zheng et al. (2016) also used friction stir spot welding to join 2 mm SS 316 plates to Al 6062 sheets of various thicknesses (1.2–1.7 mm), using Zn foil (0.1 mm and 0.3 mm) as interlayers. The Zn interlayers positively affected the lap shear strength and created no intermetallic compound. Arghavani et al. (2016) used resistance spot welding to join Al-5052, St-12 (DC 01) with low-carbon galvanized SS (ASTM A653 CST type B-G60) 1 mm and 2 mm sheets, using a ~10 ?m Zn coat on the galvanized SS. The Zn interlayer improved the welding performance when the welding current was increased. Few researchers have studied the results of welding Al to SS using sheets of less than 1 mm in thickness (micro welding), which increases the complexity of welding metals with dissimilar thermal properties. Baskoro et al. (2016a) welded Al to steel but found decreased lap shear strength of the welded joint, due to the different thermal properties of the two metals. Therefore, this study seeks to examine the effect of using a 0.1 mm sheet of Zn as an interlayer between 0.4 mm Al and 0.2 mm SS sheets using micro resistance spot welding (mRSW). The results will be assessed by the tensile strength of the nugget and the micro hardness of the dissimilar joint. For this study, stainless steel SS 301 and AA 1100 sheets were used. Zn (Hot-Dip-Zinc-coated steel sheets and coils) was used as an interlayer due to the different properties of SS and Al. The thicknesses of the SS 301, AA 1100, and Zn sheets were 0.2 mm, 0.4 mm, and 0.1 mm respectively. The metal sheets measured 19 mm x 76 mm and were washed with acetone (Baskoro et al., 2016b). 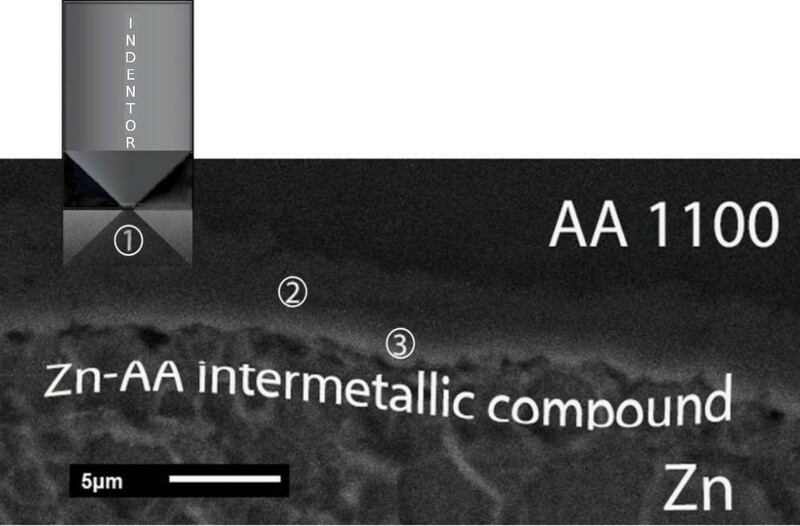 SS 301 was placed on top of AA 1100, and a Zn sheet interlayer was placed between them, as shown in Figure 1. The specimens were welded with an AC-Resistance spot welding machine (Baskoro et al., 2017), with four specimens of each welding parameter combination; three specimens were assessed by tensile testing and one specimen was assessed by a micro hardness test. For the tensile test an RTF-2350 machine was used, with a 50 kN maximum capacity, 798 mm effective stroke, 0.0005–1000 mm/min crosshead speed, ±0.1% speed accuracy, load measurement accuracy of 0.5% of indicated value, 5000 N load cell rating, 1 mm/minute test speed, maximum point, upper yield, and break point. The tensile shear test is illustrated in Figure 2. The welding parameters studied were welding currents (5 kA and 8 kA) and welding times (6, 8 and 10 cycle times [CT]). The welding force, holding time and other parameters were assumed to be constant. The welding current is the electrical current used to generate heat input, and welding time is the duration of the electrical current through the metals welded. Welding currents and welding times are greatly affected by the heat input of the mRSW process. The welding parameter combinations, represented as specimen codes, are shown in Table 1. In the micro hardness analysis, the alloys were analyzed using a digital microscope (Oxion inverso Euromex) and the hardness of the intermetallic alloy was measured using the Vickers hardness test. The indentation positioning used to measure the hardness of the diffusion zone between Al and Zn or Fe and Zn is shown in Figure 3. Tensile and micro hardness measurement tests were performed to study the mechanical properties of the SS-Zn-AA dissimilar joints, with Zn in the weld nugget. SS-Zn-AA-510 could not be measured due to its brittleness; various, diverse tensile tests were tested. Figures 4 and 5, respectively, show the highest and lowest peak shear loads from each welding parameter combination. Figure 4 shows that the highest peak load of all the parameter combinations was achieved using an 8 kA welding current with a 10 CT welding time; this resulted in a 1.5 mm displacement and a 98.9 N peak load (SS-Zn-AA-810). Weld nugget displacement tended to decrease with time, as shown by specimens SS-Zn-AA-86, SS-Zn-AA-88 and SS-Zn-AA-810. Displacement of the specimens that were welded with the 5 kA welding current tended to increase, despite their brittleness; SS-Zn-AA-58 achieved a 113.7 N peak load and a 0.89 mm displacement. The peak load of SS-Zn-AA-88 was 108 N, which was lower than that of SS-Zn-AA-58 and higher than that of SS-Zn-AA-810. 5.7 N was the margin of peak load value between SS-Zn-AA-58 and SS-Zn-AA-88. 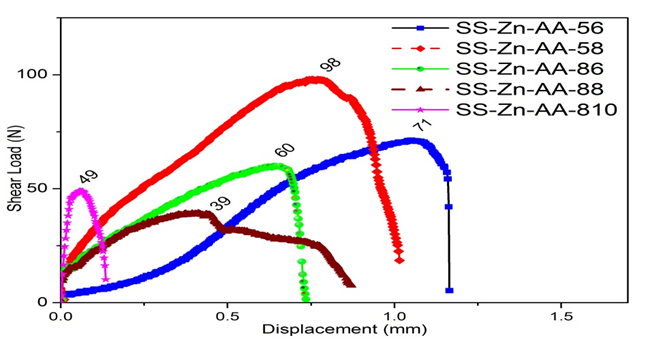 The displacements of all the welding parameter combinations shown in Figure 4 were higher than 0.5 mm, with the exception of SS-Zn-AA-56, which was around 0.25 mm. SS-Zn-AA-58 had the highest low peak load, as shown in Figure 5. It also had a longer displacement than any of the nuggets welded with an 8kA current. The load value and displacement were 98 N and 1.06 mm. SS-Zn-AA-810 had the lowest peak load and the shortest displacement; the value of displacement was 0.135 mm and the peak load was 49 N. Figure 5 also shows that the peak load value of a nugget welded with 8 kA tended to decrease, to lower than 65 N. Overall, Figure 5 shows that peak loads tended to decrease when the welding current and time increased. SS-Zn-AA-58 nuggets were therefore capable of generating the highest and lowest shear loads, with a high peak load of 113 N (Figure 4) and a low peak load of 98 N (Figure 5). SS-Zn-AA-88 generated the second highest high peak load, by a margin of 5 N from SS-Zn-AA-58. In general, peak loads using an 8 kA welding current were lower than with a 5 kA current (Figure 5). It was found that the hardness properties of the diffusion zones affected their brittleness. The diffusion zones developed in the weld nugget in three parameter combinations are shown in Figure 6. Figure 6 shows that the grain in the µm scale in both interlayer and AA has changed. The red line on the AA side indicates that the grain under the line has not changed. In addition, the grain in the upper red line has changed and is bigger than on the AA side. This diffusion zone affected the mechanical properties of welded metal. It can be seen in Figure 6 that the size of the grain in the zinc region that has melted becomes larger when compared with areas that are not exposed to heat or have not melted. The Zn layer as an interlayer in the nugget region is thinner as time and welding current or heat input increase. The zinc layer is narrower because of the distortion of the steel and the mixture of steel with zinc in the nugget, where the zinc melting point is lower than that of aluminum and steel. The low input and thermal conductivity of zinc leads to it melting first (Boucherit et al., 2017). The intermetallic layer becomes more visible due to the low melting point of zinc and the higher specific gravity of the Fe element in steel. Vibration due to the magnetic field when current flows and increased heat input also causes the intermetallic layer and mixing of steel and zinc. This intermetallic growth process also occurs in the Al-Cu joint and Zn as interlayer using ultrasonic technology, where the ultrasonic vibration and heat input result in the formation of intermetallic layers (Balasundaram et al., 2014). The six dissimilar joints were each measured using the Vickers hardness method; the corresponding values from each dissimilar joint are shown in Figure 7. 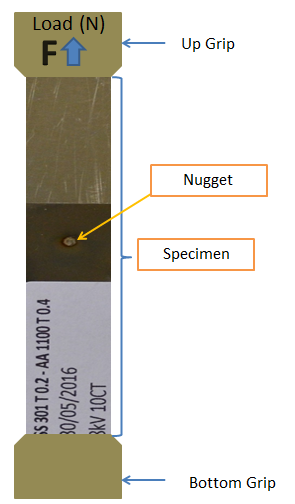 Figure 7a shows the hardness values of nuggets welded with an 8 kA welding current. The nugget welded for 6 CT (Spec 1) received the first indentation; therefore, this value represented the hardness of the dissimilar joint near the SS. This hardness value was higher than those observed after 8 CT and 10 CT of welding; the hardness values decreased from 296 HV to 274 HV, and the hardness values of Specs 2 and 3 were the same. SS-Zn Spec 2 shows the hardness value of the center of the dissimilar joint. This value increased with SS-Zn-810, which was 296 HV. Spec 3 of SS-Zn represents the hardness value of the nugget closest to the Zn. This value tended to decrease wherever the hardness of the dissimilar joint of SS-Zn Spec 3 with 10 CT welding time was not measured, since the length of the dissimilar joint decreased. The hardness value of SS-Zn at 6 CT and 8 CT were 321 HV and 296 HV respectively. AA-Zn Spec 1 shows a hardness value near the AA. The hardness values in the nuggets welded for 6 CT and 8 CT were similar, increasing at 10 CT to 350 HV. AA-Zn Spec 2 represents the hardness value in the center of the AA-Zn dissimilar joint. These values tended to increase. The nugget welded for 6 CT had the lowest hardness value at 274 HV. AA-Zn Spec 3 represents the hardness value of the dissimilar joint near the Zn layer, which increased from 296 HV to 420 HV. The highest hardness value was found in the nugget welded for 10 CT with 8 kA, at 420 HV. Figure 7b presents the average of three points of micro hardness measurement. A welding current of 8 kA appeared completely dissimilar joint, as explained before. The micro hardness of the SS-Zn sheets tended to decrease, while that of the AA-Zn increased significantly. The highest hardness value of SS-Zn (373 HV) was achieved with a time of 10 CT, and the lowest (289 HV) was achieved with 6 CT. The lowest AA-Zn nugget had a hardness value higher than the highest SS-Zn; the lowest AA-Zn was 297 HV and the highest SS-Zn was 289 HV. The lowest hardness value of AA-Zn intermetallic was 281 HV, which was developed with a welding time of 8 CT. The hardness value of the dissimilar joint near the SS tended to increase, due to the fact that the welding time made the melting area increase, so the hardness value of SS-Zn Spec 1 after 10 CT demonstrated the highest hardness value. The hardness value in the center between the SS and AA was same. It positively affected the heat input and enhanced the melting zone. The hardness value between the SS and Zn sheet decreased; however, the value increased when compared to the hardness values of SS-Zn Spec 1 and SS-Zn Spec 2. 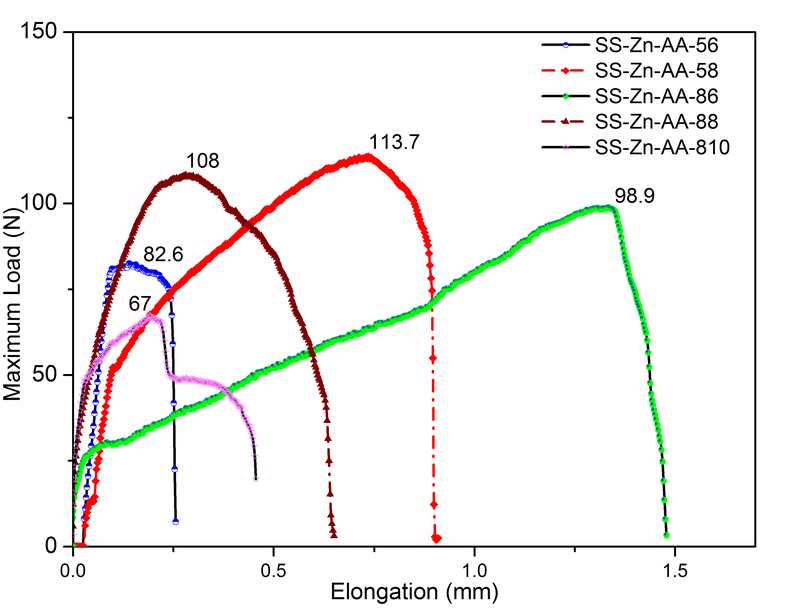 The AA-Zn hardness value was same; however, SS-Zn-Spec 1 was higher than Spec 2. In addition, AA-Zn Spec 3 shows the highest hardness value because of the number of Ferro atoms, which means that the Fe composition tended to increase. This result shows that the Ferro composition diminished when the melting area increase. This is consistent with the results of Boucherit et al. (2017), who found that Cu atoms were inserted between Zn and Al because the thermal conductivity of Cu was higher than that of Zn, and the melting point of Zn was lower than that of Cu. By increasing the micro hardness of the intermetallic compound, it increased brittleness (Balasundaram et al., 2014; Ustinov et al., 2017; Liu et al., 2017). SS, AA and Zn sheets were joined using 5 kA and 8 kA welding currents. It was found that the nuggets welded with 5 kA were deficient; the best result was achieved at 8 CT, with the highest peak load of 113 N. In comparison, a 108 N peak load was achieved using 8 CT with an 8 kA welding current; this was the second highest peak load observed in our study. Moreover, nugget displacement was over 0.5 mm. Using Zn as an interlayer thus resulted in increased nugget displacement. The micro hardness of the SS-Zn dissimilar joint tended to decrease, although the third indentation could not be achieved due to the shorter diffusion zone. The micro hardness of the SS-Zn dissimilar joint near the SS layer also decreased, while that of the dissimilar joint near the AA and Zn layers increased. Moreover, the micro hardness near the AA significantly increased. The diffusion zone also affected the brittle properties, which is consistent with other research results. The authors would like to thank the Ministry of Research and Technology and Higher Education (RISTEKDIKTI) for its financial support through the PTUPT 2018 program (contract number 488/UN2.R3.1/HKP05.00/2018). The authors would also like to thank Mr. Syaiful Mukti (Quality Control Manager in PT Kerismas Witikco Makmur) for supporting the research. Kumar, S.S., Krishnamoorthi, J., Ravisankar, B., Balusamy, V., 2017. Assessing Quality of Diffusion Bonded Joints with Interlayer using Ultrasonic/Ultrasound. Journal of Materials Processing Technology, Volume 242, pp. 139–146.